Blame it on being road-weary. Blame it on not having any good ideas. Heck. Blame it on the rain, yeah-yeah... You gotta blame it on something! After a not-so-impressive meal at Mizuki Buffet the night before, you'd think we were all buffet'd-out... No, not us... As we were driving back up to Vancouver from Seattle, we stopped at an ol' friend, being the Eagles Buffet at the Tulalip Casino Resort. Sure, it isn't going to bring back memories of Vegas, but for the money (especially lunch), it sure beats eating at the mediocre options in and around the Seattle Premium Outlet. Seemingly stuck in a time-warp, the food selection hasn't changed much since I last blogged about the place. 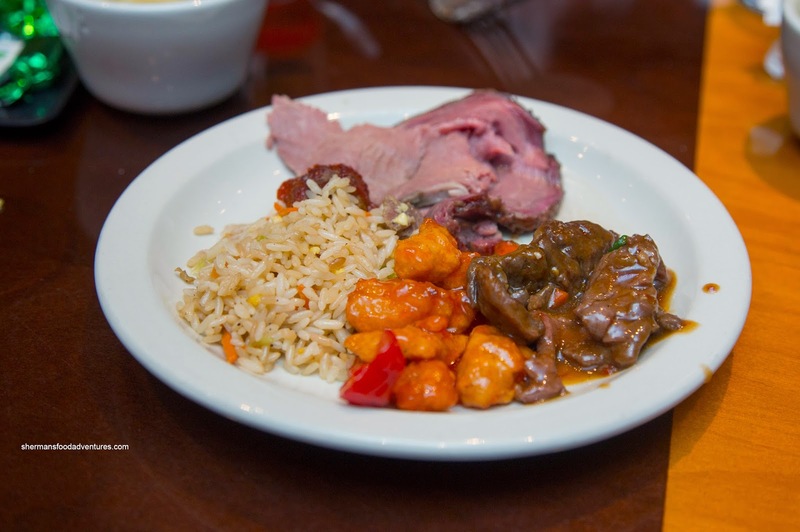 Starting on the right side of the buffet, there was a substantial offering of "Chinese Food". Yes, it is your typical sweet n' sour stir fried stuff not found at any actual Chinese restaurants. With that being said, I still found it mediocre even for Americanized fare. 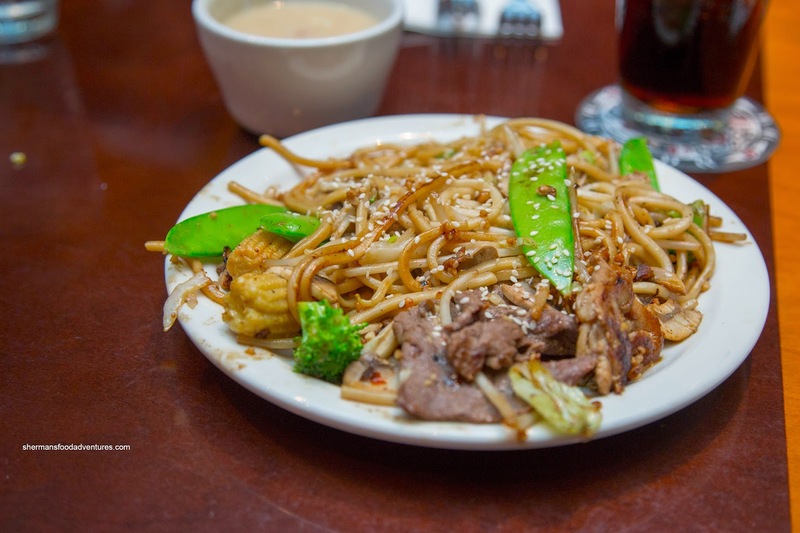 For instance, the Mongolian Beef was not subjected to much tenderization, hence it was rather chewy while completely oversauced. In fact, all the dishes, excluding the pork fried rice were wet. Probably a direct result of either weak wok heat and/or overuse of moisture in the cooking process. 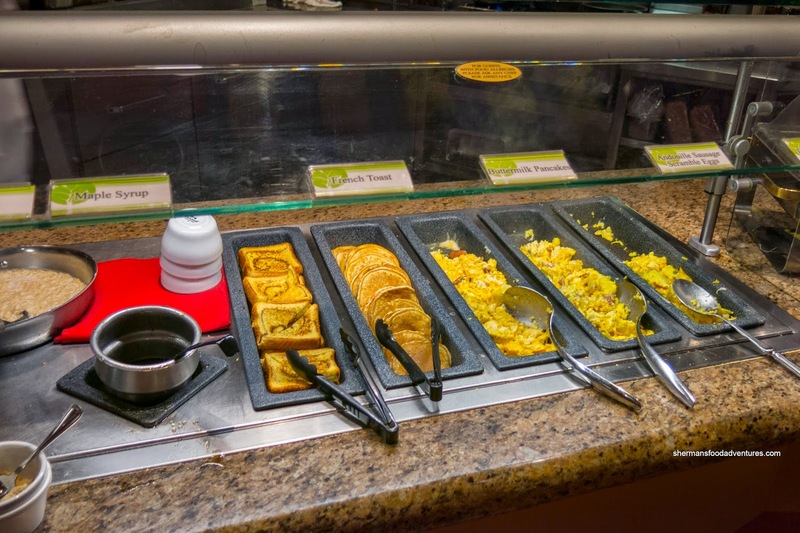 Next door, there was a substantial selection of Breakfast Items including link sausage, sausage patties, bacon, prime rib hash, spicy scallop potatoes with ham and scrambled eggs. Pretty standard stuff here and to be honest, with so many other options, I tend to leave these items for the kiddies (in particular, my son). But wait, it didn't end there... In addition to the big pot of oatmeal, there was French toast, pancakes and 3 types of egg scrambles. Naturally, my son went for the pancakes to my dismay... I guess the Chinese tradition of eating the meats and most worthwhile items at a buffet ends with him (at least our family lineage). But I didn't give him a hard time because I dug into the biscuits and gravy with a side of country fried steak. And this was to Viv's chagrin... I never learn because country gravy goes with my stomach as well as a shootout and Roberto Luongo. Now onto the main event, we found the same dishes offered in the last 10 years since its inception. Generally, I find buffets do fried chicken decently and this was no different as each piece was fried golden brown and crunchy. The batter was nicely spiced being peppery and a touch salty. Although the chicken was exactly juicy, it wasn't dry either. 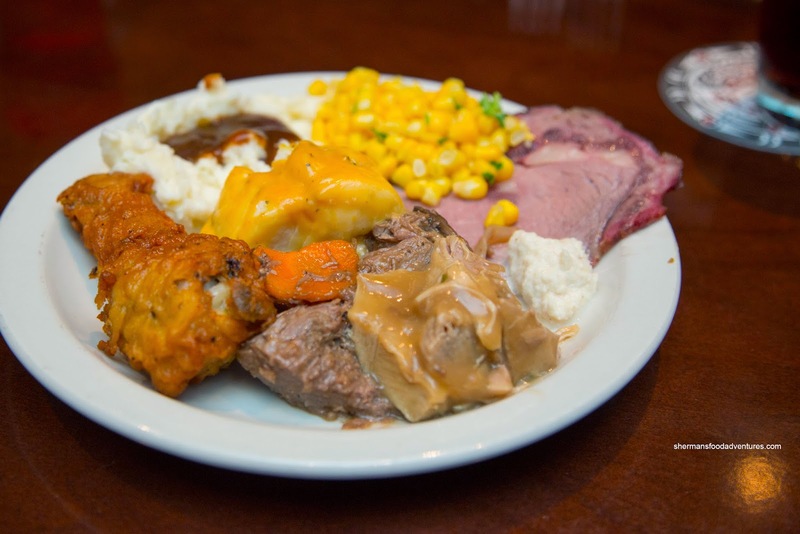 Yet another staple at this buffet, the pot roast was relatively moist and fork tender. However, much like always, I found it far to salty. Something different was the Hollandaise BBQ cod which was terrible. The cod was super dry and hard while the sauce resembled more like a salty cream sauce than an actual Hollandaise. Dressed in gravy, the roast turkey was somewhat moist while the meatballs were not dry and completely swimming in a sweet sauce. In between these 2 stations was the carving table that featured prime rib, ham and salmon. Surprisingly, the rib roast was nicely medium and succulent. Naturally, the salmon was somewhat dry being overcooked. 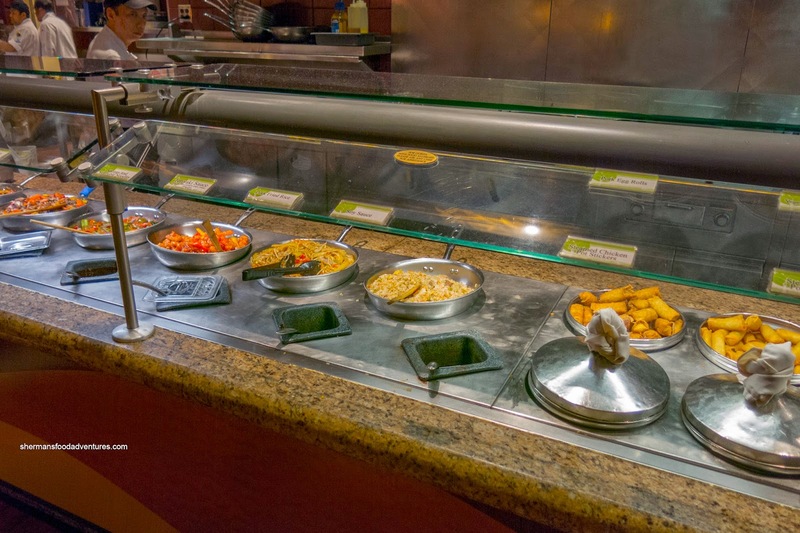 One thing I know that will usually turn out properly in terms of freshness and execution is the Mongolian Grill station. 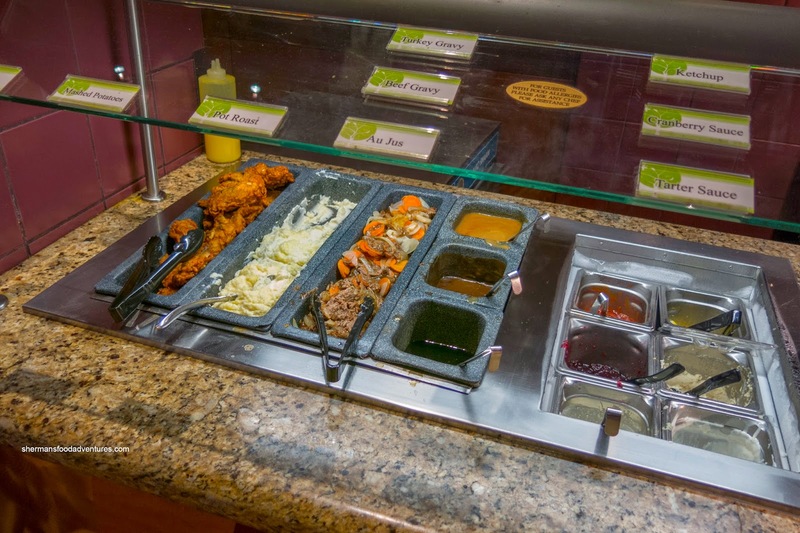 The one at Eagles Buffet is simple with only 3 meats, some veggies and noodles. 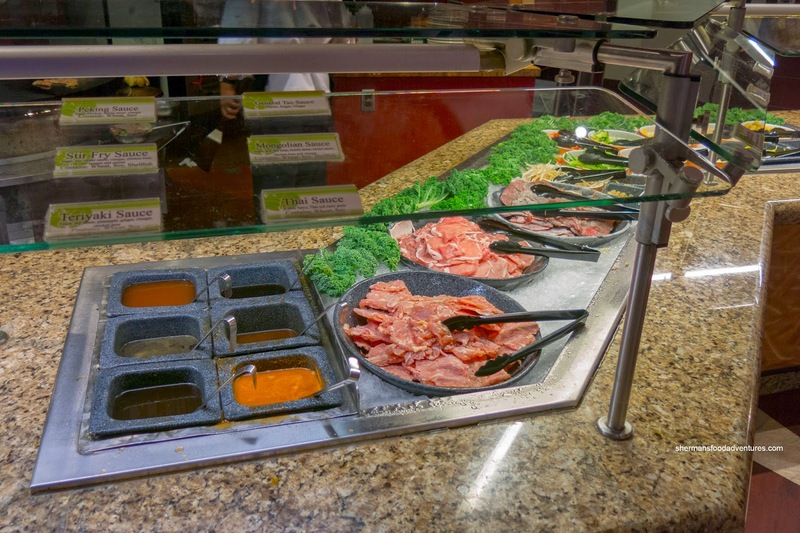 Sauce selection is limited to only 6, but really, there is no need for more. This time around, I loaded up with more noodles (and I give my son a hard time with the carbs...) and it came out more or less how I wanted it. There was carmelization of the ingredients, but it could've been a bit more so, yet it tasted okay and the veggies were still crisp while the meat was only a touch chewy. Not shown in this picture is the station directly to the left where there was a selection of pizza. 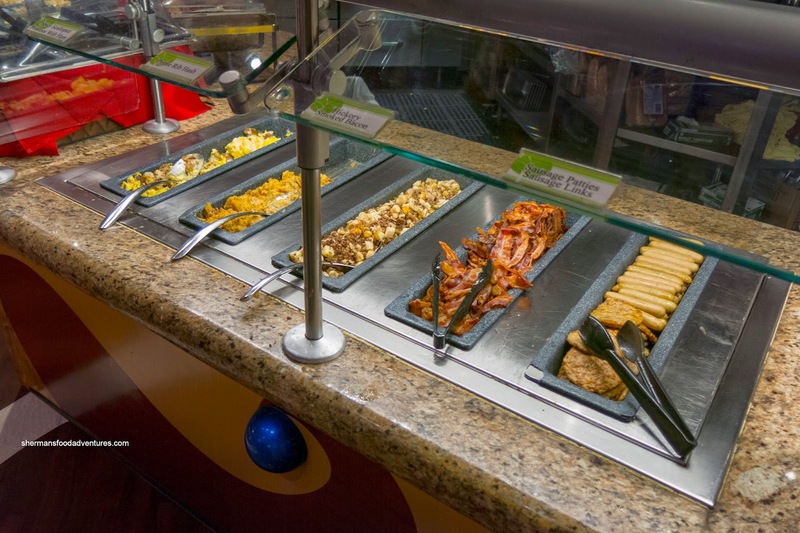 Of course there was a salad bar (which I avoided like the plague), fresh fruit and soup bar, but I only had a bowl of the clam chowder (also to Viv's chagrin... darn those tasty creamy foods!). 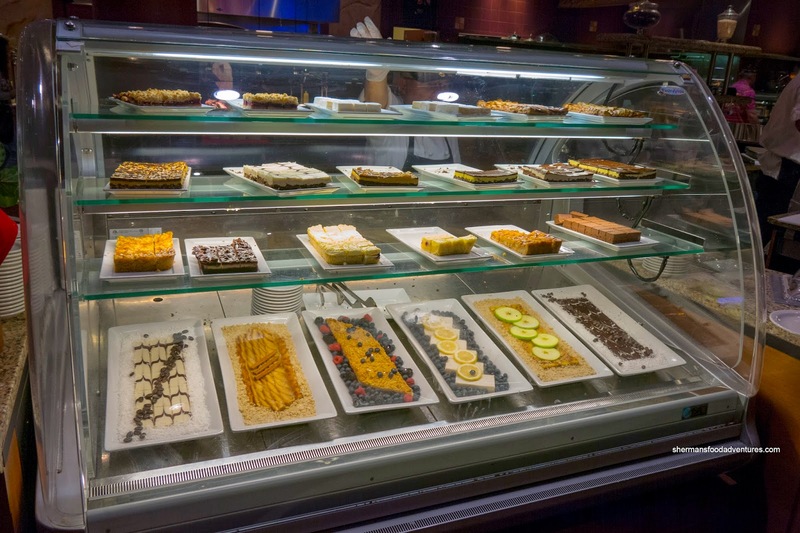 Completing the impressive selection of food was a large Dessert section that featured hard ice cream, pastries and cake. 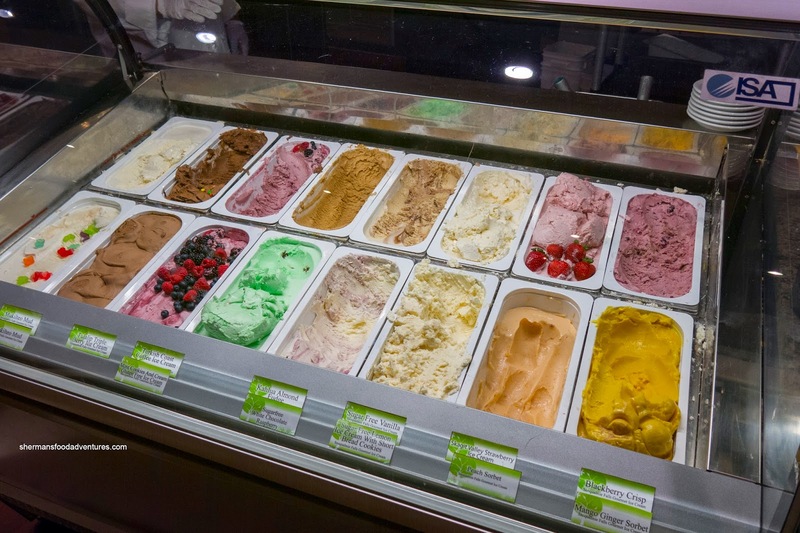 It was nice to see some sugar-free options as well. Again, nothing to write home about, but okay nonetheless. 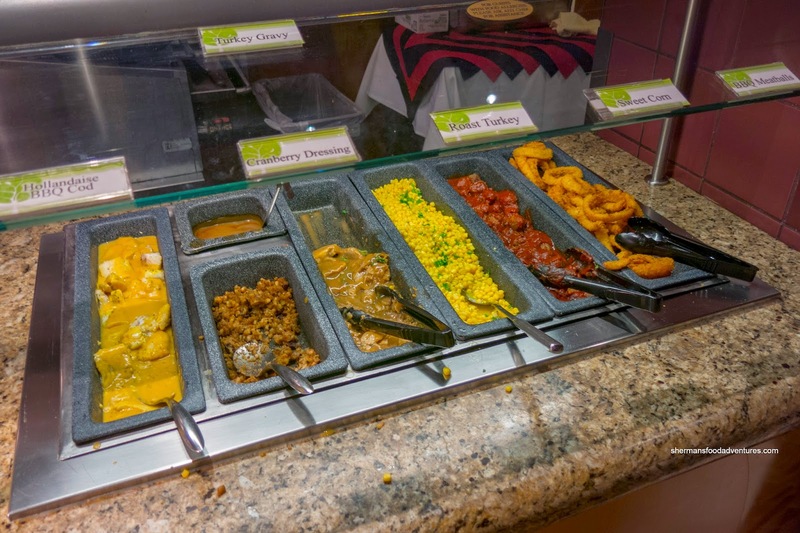 That pretty much sums up the Eagles Buffet as it is generally a means to fill you up for a reasonable price (better at lunch than at dinner with much of the same stuff). 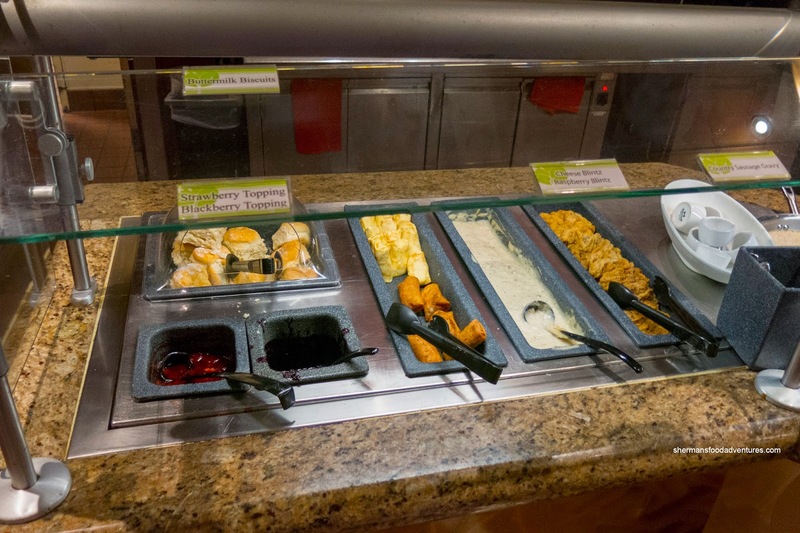 There is nothing really that fancy about the buffet, unless you go for their seafood nights. But if you aren't too picky, then it does the job.